Looking good, how is the machine running? Let's run some scans for remnants and orphans. Please disable your antivirus for the duration of my instructions. Don't forget to re-enable them after you have completed the steps. If threats are detected, click the Apply Actions button, MBAM will ask for a reboot. Click History, then Application Logs, then check the Select box by the first Scan Log in the list. Click View, then click Export, select text file and save to the desktop as MBAM.txt and post in your next reply. Please note: You can use Internet Explorer or Firefox for this step. Either browser used will have to be ran in admin mode. Right click on either the Internet Explorer icon or the Firefox icon in the Start Menu or Quick Launch Bar on the Task bar and select Run as Administrator from the menu. If you use Firefox, you will be prompted to download esetsmartinstaller_enu.exe. Please do so, then double click it to install it. Make sure that the option Remove found threats is NOT checked. Use notepad to open the logfile located at C:\Program Files(x86)\ESET\EsetOnlineScanner\log.txt. I left the ESET scan going, and when I came back it appeared that my computer had restarted. I checked and there was a log, however it is very short, so I am not sure if the scan completed. Here is what I have. Ok, let's run it again and see if the same result occurs. 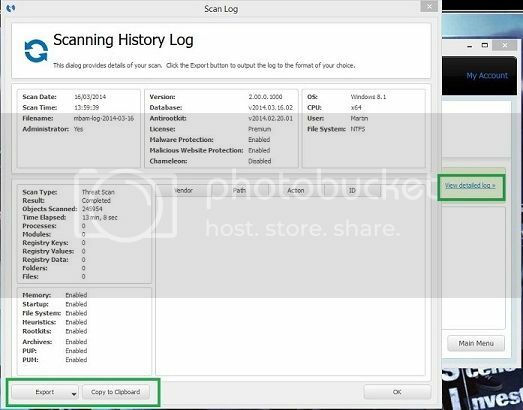 The MBAM log quarantined everything it found, but I'd like to make sure with the ESET log. If it does the same thing again, we'll proceed. Also, please don't forget to run the SecurityCheck program and post the log. If you'd like, you can run it before running ESET and post the log.